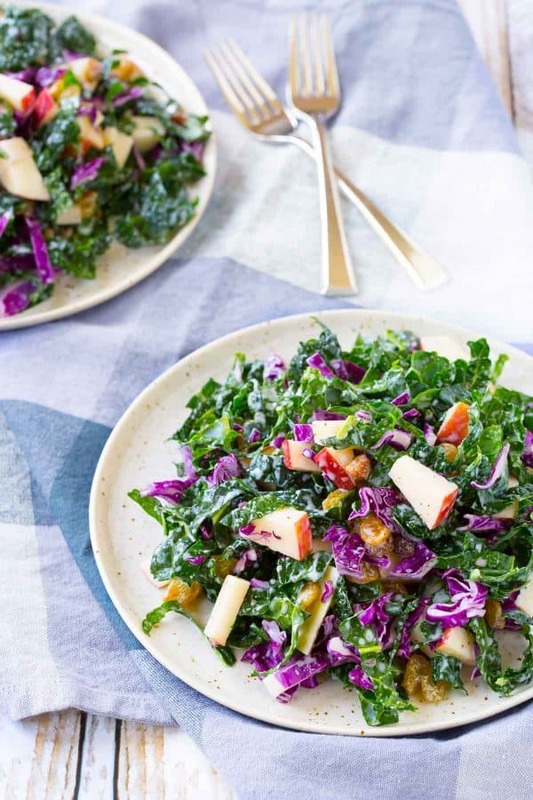 The perfect salad to keep in your fridge and grab at lunch time, this kale salad with apples and raisins is tangy, tart, sweet and full of flavorful nutrition. Confession: I’m writing this post immediately after finishing one chocolate chip cookie…and one ball of chocolate chip cookie dough. Best of both worlds, ya know? I should be eating more kale salad and less cookie dough, probably. I think I’m dealing with my stress by eating allthefood. Not the best coping mechanism, I’m aware. I’ve got the grumpiest 5-year-old on my hands lately with strong will and a bad attitude. If I was a child psychologist, I would say she’s having a hard time dealing with all the change going on right now in our lives and with Ben being gone Monday through Friday every week. She goes from sweet as honey to “I don’t like you, I’m never talking to you again!” in about .5 seconds. And for the record, she has yet to follow through on those “I’m never talking to you again” threats. Some days I wouldn’t mind, to tell you the ugly truth. Anyways, we’ll get through it just like we always do. Thankfully she’s really excited about the move, but I know it’s still hard on her little mini type-A personality. No idea where she gets that from. In the meantime, do you think I can train myself to stress eat kale salad instead of popcorn doused with butter or cookie dough balls? If you like tangier dressing, cut back on the honey a bit or increase the amount of lime juice. 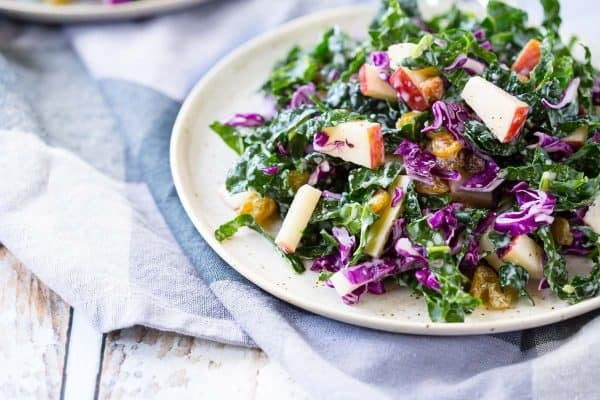 The golden raisins in this salad lend a surprising amount of sweetness. 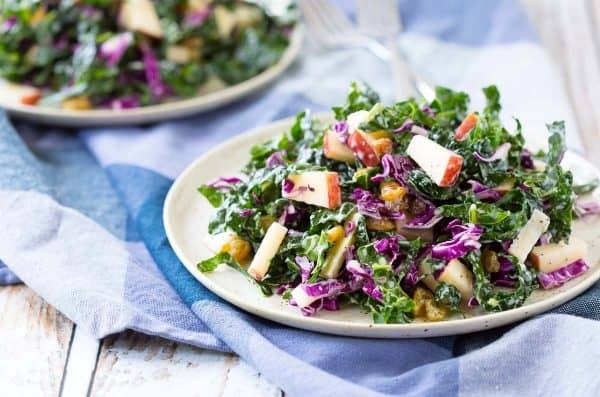 Now let’s all eat our feelings with a great kale salad? 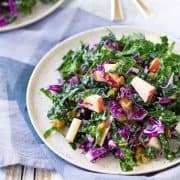 In a large bowl, add kale, chopped apple, raisins, and cabbage. 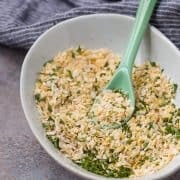 Mix dressing ingredients in a small bowl or measuring cup until combined. 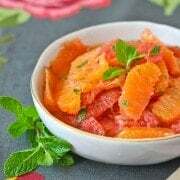 Taste and add more honey if desired to make it sweeter, or more lime juice if you like it tangier. Pour dressing over salad and mix to combine. 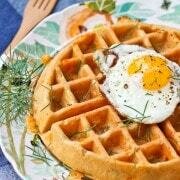 Best refrigerated 1-2 hours before serving but great immediately too. Verdict: Love the crispy and hearty texture of this salad. And how beautiful is it? Husband’s take: He actually prefers the dressing a little on the tangier side which is easily remedied with slightly more lime juice or less honey. PS: Browse my whole archive of salad recipes for more great ideas! Applesauce could work but it may lead to a grainy texture. 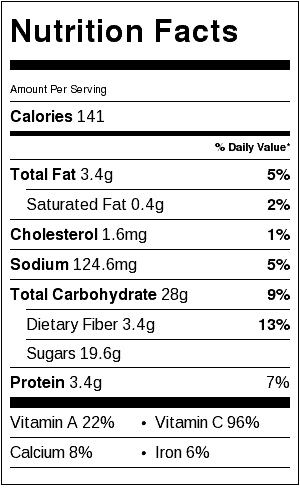 The dressing may be fine without any sweetener at all if you like things on the tangy side. Otherwise I’d maybe try any sugar substitute that you’d normally use. This salad looks like absolute perfection! 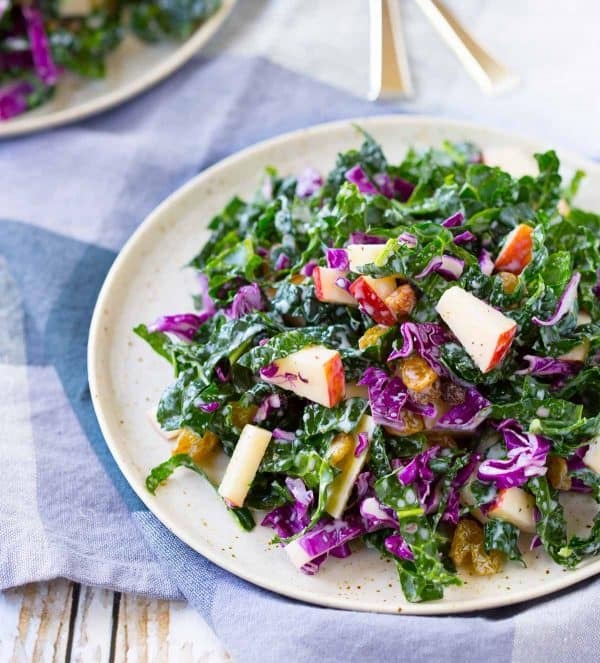 I’m loving all the flavors and textures..apple + kale is one of my go-tos! Definitely the perfect post-cookie dish. Sorry to hear about the grumpy kidlet…probably just a phase that everyone will get through.